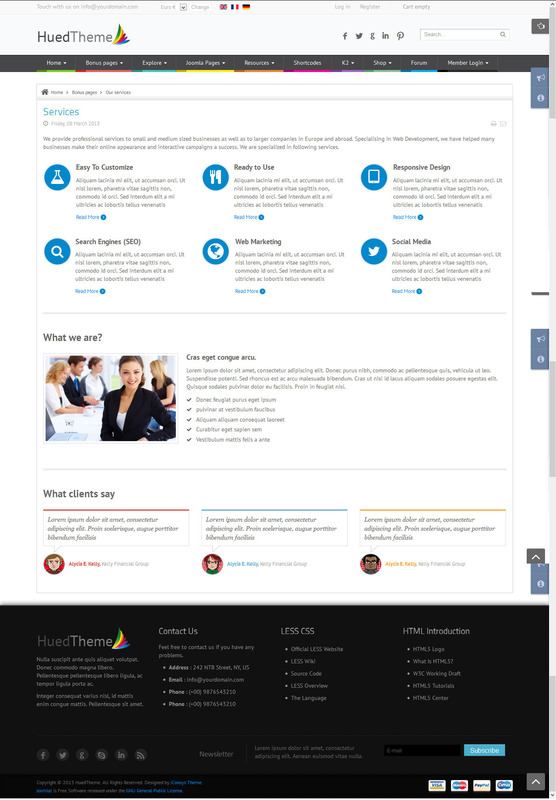 Hued Theme presents such easier admin users interface where customizing & controlling the designs would have no boundaries. Hued Theme gives you full control over your fonts. You can change your Fonts instantly; even integrate any Google Fonts or Customized fonts on your site within a single click. This unique feature of Hued Theme supports RTL (Right to Left) Language based Designs like Arabic, Farsi & Hebrew. Bootstrap is made upon responsive CSS Designs with less code which enhances the overall look of your website. We make perfect use of CSS3 to enhance your web presence lucrative. Advanced Typography based on Bootstrap would enable you styling your Tables, Forms, and Buttons along with other elements to make your website more beautiful. 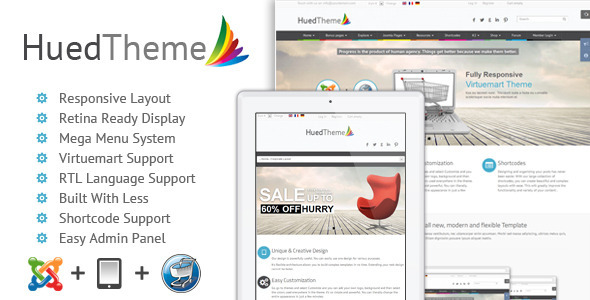 Our Hued Theme would have lots of useful Shortcode installed by using which anybody can add lots of extra features on website & execute these without having any coding knowledge. Hued Theme decreases your website loading time drastically by using Advanced CSS & JS compression system for any specific browsers that the users will be using. Users can easily integrate Google Analytics Code on their website and can maintain all the features that Google Analytics are providing. We checked every major browsers to make the template compatible. Design it to run today’s most poupular web browsers. Be sure to check and review what it does and doesn’t support.
? 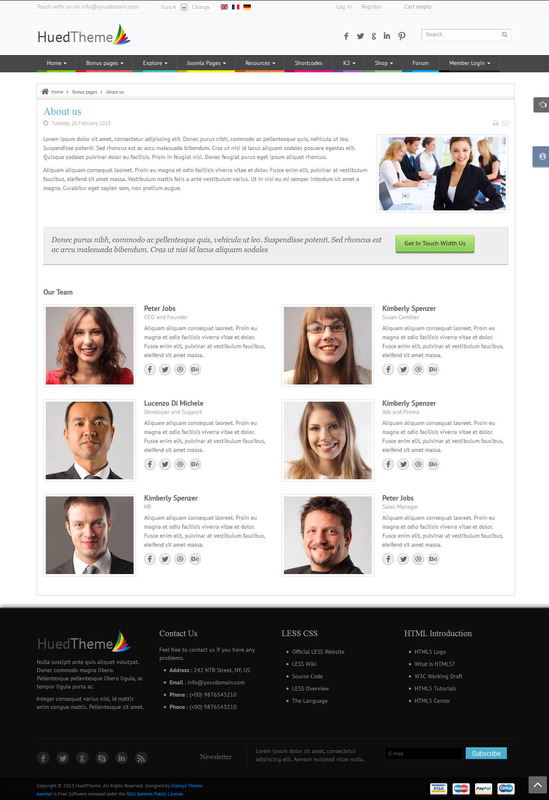 Compatible with Joomla 2.5+ including quick start package.
? Designed with HTML5 and CSS3/.less.
? Fresh and Clean Design.
? Customizable Design and Code.
? Anything Slider Design Styling.
? Quick Contact Module Style.
? Google Map Module for use Contact Page.
? All installed Extensions (Component, Modules and Plugins) are included in package.
? Virtuemart 2.0.24c with Responsive Design.
? 100% Tableless design. 100% CSS/DIV compliance.
? Delivered with ?QuickStart Package?
? Documentation included for your help.
? And much more features.
? More features coming soon just stay with this template. We’ve used the following images, icons or other files as listed.